We are both a wine bar and a wine shop! Explore our superb range of hand selected, high quality and ever-changing wines. Take a glass and choose your favourite from over 30 different bottles. Sit, relax, sip, swoosh and swirl in our wine bar and why not mix and match your choices to accompany the range of delicious fresh food. 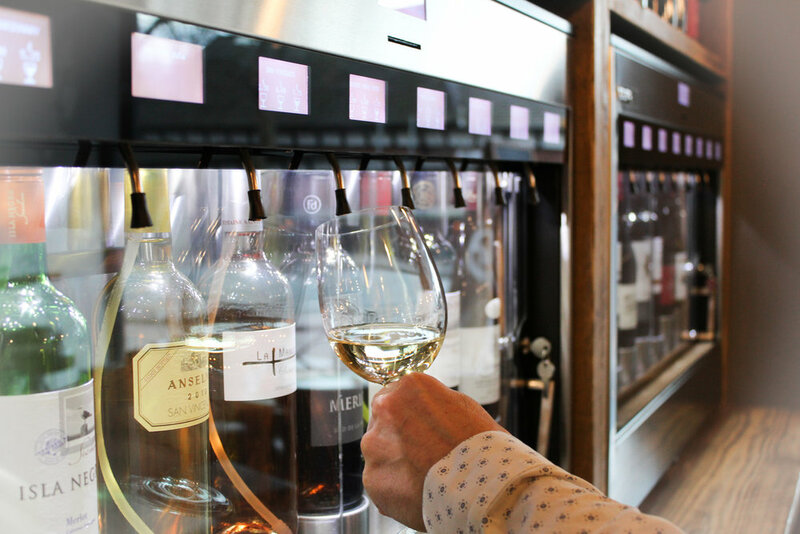 Enjoy a chilled and relaxed atmosphere where you can sample at your leisure from our Enomatic wine dispensers or simply ask our friendly and knowledgeable staff for more information. All our wines have take-out prices so they can be sipped, swooshed and swirled in the comfort of your own home. At Sip we’ve used our many years of experience in the wine business to bring you delicious and value for money wines from around the world. We work hard with our specialist suppliers to bring you a more exciting and diverse range, rather than the wines normally found on the high street. Ever been disappointed with a shop-bought bottle of wine? You can use our Enomatic wine dispensing systems to select and taste, allowing you to explore and find great wines all by yourself. Simply purchase a card and put on your desired value, then grab a glass, place it under the machine and sample at will. Why not start with a small sample until you find your favourite wine and then have the option of buying a larger glass or a bottle to drink in or take home? As our wine works brilliantly with food, we also offer you a variety of plates containing the finest local produce for you to mix and match. Enjoying great wines for yourself in an unhurried and relaxed environment is so important, but if you have any questions, we have our friendly staff on hand to advise you. Nick has over 25 years’ experience across all areas of the Hotel and Catering trade. Having worked for market leading retailers and highly respected importers and distributors, he has worked closely with and supplied some of the best bars, restaurants and independent specialist retailers across the north of England. It was this experience that led to the idea of merging the two areas to bring together the best of both worlds and make exploring wine a richer experience. Combining the range and specialism of traditional wine shops, along with the relaxed and welcoming environment of a bar, is something that he has been working towards…. Welcome to Sip.